Anyone who has type 1 diabetes knows how difficult this disease can be to manage. Doctors recommend checking blood sugar levels around eight times every day, which is extremely inconvenient and painful for many diabetics. Thankfully, a group of researchers at Oregon State University are hard at work creating a convenient way to track blood sugar levels: high-tech contacts. Oregon State's team recently developed a biosensor that's able to track blood glucose levels in a patient's tears. The lead researcher on this project is Dr. Gregory Herman, a professor of chemical engineering at Oregon State University. Although Herman doesn't have diabetes himself, he knows plenty of friends who suffer with the debilitating condition. Herman told reporters that his group started to get serious about developing tiny glucose monitors just a few years ago. Oregon State actually partnered up with Pacific Diabetes Technologies to explore the possibility of creating glucose biosensors for contacts. Engineers at Oregon State said their transparent biosensor is easily able to comfortably fit inside any normal contact lens. The sensor is designed to analyze fluctuations in the eyes' pH levels, which gives off great information on the body's overall blood glucose level. Amazingly, these sensors can let a patient know when to give themselves an insulin injection. If the patient already has an insulin pump, the contacts could even send a signal to release the insulin automatically. Although this device is only in prototype form now, scientists are extremely interested in its potential. Many researchers believe these high-tech contacts could detect even more diseases in the near future. Herman told reporters that these contacts could hold more sensors with the ability to check for diseases like glaucoma, renal disease, and even certain kinds of cancer. The Oregon State team hopes to implant hundreds of medical sensors into one of these high-tech contacts very soon. While Oregon State's contacts are quite impressive, they aren't the only smart contacts now in development stage. For example, Google began working on its own brand of glucose-detecting smart contacts with the company Novartis in 2014. Google's smart contact project, however, has been stalled ever since Novartis announced it couldn't conduct clinical trials due to technical issues. A few other companies interested in developing smart contacts include Sony, Samsung, Sensimed AG, and President Engineering Group. People with type 1 diabetes aren't able to naturally produce the sugar-controlling hormone insulin. Once a diabetic's blood sugar level becomes too high, they need to physically inject insulin into their system. Symptoms of type 1 diabetes are often first noticed in adolescence and include frequent urination, hazy vision, headaches, general fatigue, and an increased heart rate. Although diabetes isn't treatable, there are various ways to manage the chronic condition. All diabetics need to be very conscious about what they eat, monitor their blood glucose levels, and have insulin injections nearby. 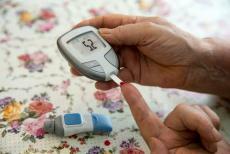 The International Diabetes Federation (IDF) currently estimates that 415 million people have diabetes around the world. By 2040, the IDF predicts that number will rise to a staggering 642 million.